Looking for a Community Service Project? Take and Make Seed Packets are a great Community Service Project that you can do at YOUR location! We need your help packaging up our beautiful Hollyhock and Sunflower seeds. 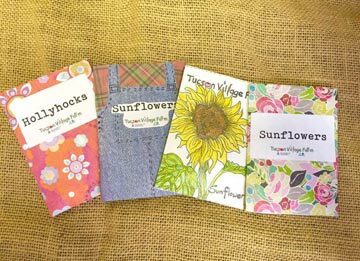 If you and your group are looking for a creative and fun way to help the Farm and complete a service project at the same time, our Make-and-Take Seed Packets are just the thing! You can check out a craft kit, take it home, make and fill seed packets and then bring them back to the Farm. Please contact Kalee Hunter at kchunter@email.arizona.edu to schedule the pick up.